DEXA or Dual Energy X-Ray Absorptiometry is an advanced, scientifically developed technology. DEXA is the gold standard in measuring body composition and assessing bone health for osteoporosis. We have been performing DEXA Scans for over 20 years! With our solid experience and expertise, you are coming to the best facility for your DEXA Scan. Our priority is YOU and helping you achieve your health/fitness goals. Remember, "What gets measured gets managed! DEXA or Dual Energy X-Ray Absorptiometry is an advanced, scientifically developed technology. 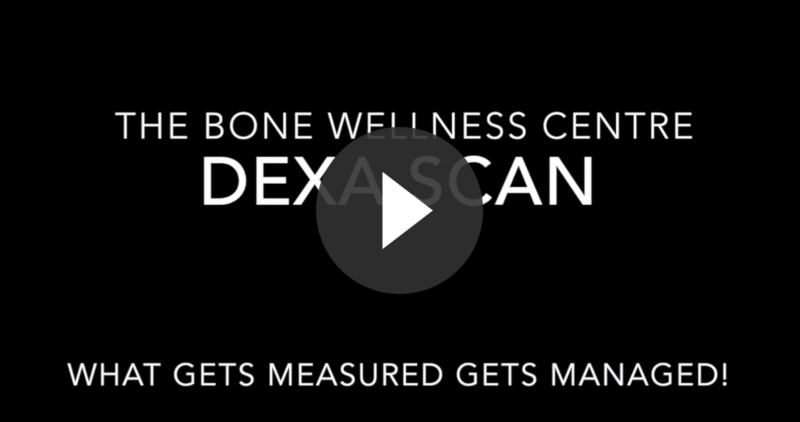 DEXA is the gold standard in measuring body composition and assessing bone health for osteoporosis. We have been performing DEXA Scans for over 20 years! With our solid experience and expertise, you are coming to the best facility for your DEXA Scan. Our priority is YOU and helping you achieve your health/fitness goals. Remember, "What gets measured gets managed!" DEXA Scan is the gold standard to measure Body Fat, Lean Muscle Mass & Bone Mineral Content. 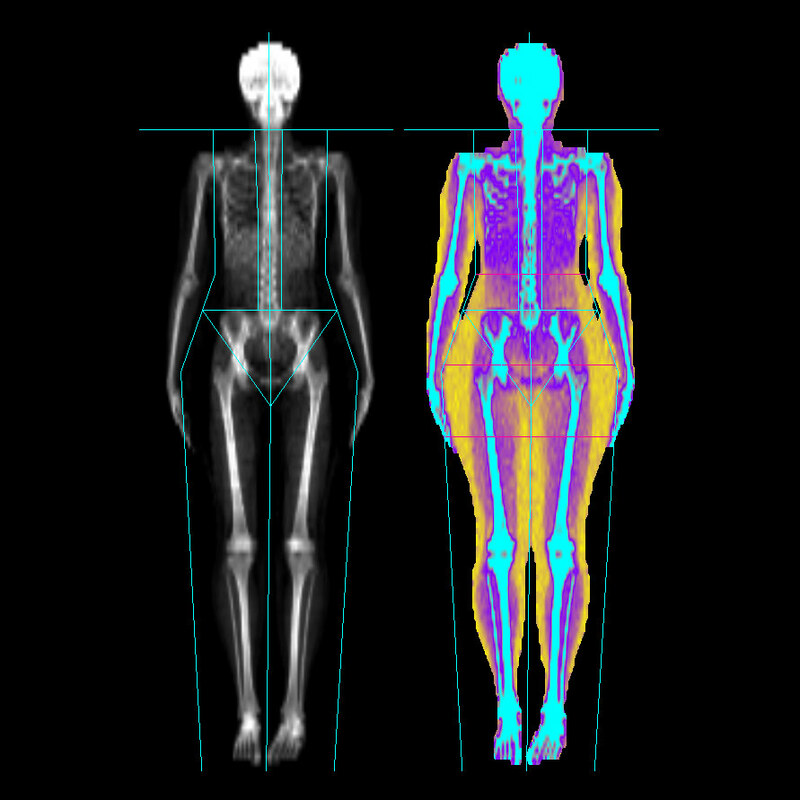 Our new DEXA Scans include a colour coding feature to the body composition image showing you more intensely & separating where the fat, muscle tissues & bone are concentrated. 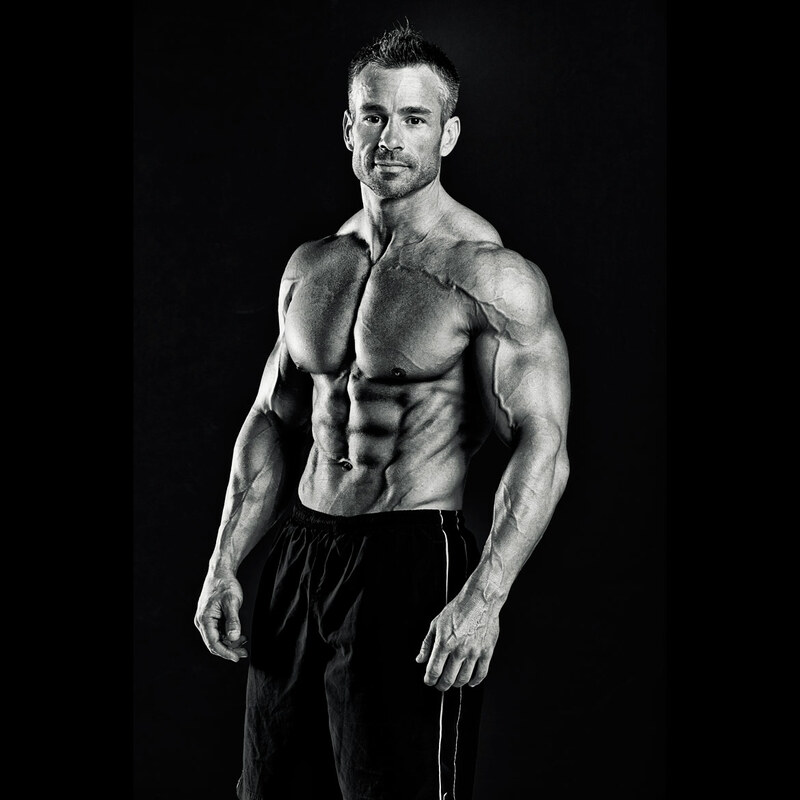 Establishing a baseline is crucial prior to starting a program, knowing your exact numbers will give you a benchmark for your health, body, fitness & nutritional goals. 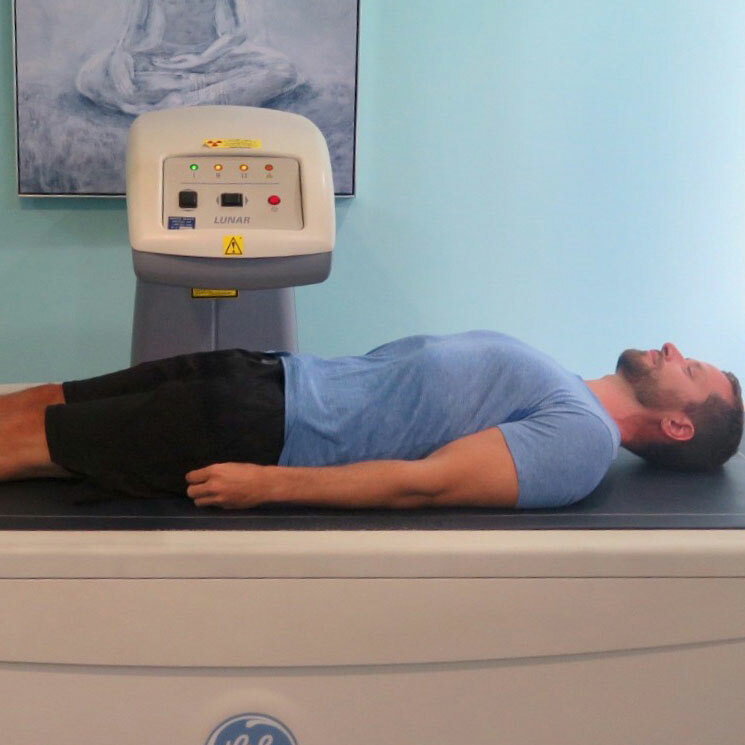 DEXA Scan provides a Resting Metabolic Rate (RMR) based on the total amount of lean and fat tissues in the body. This guides one in knowing how many calories one can take to increase or decrease their weight in a health manner. DEXA Scan measures the abdominal fat and also looks at the distribution of fat using the android (waist) to gynoid (hip) ratio. High levels of abdominal fat are strongly linked to heart disease, diabetes, stroke and cancer. Be proactive in the prevention of disease & better quality of life! 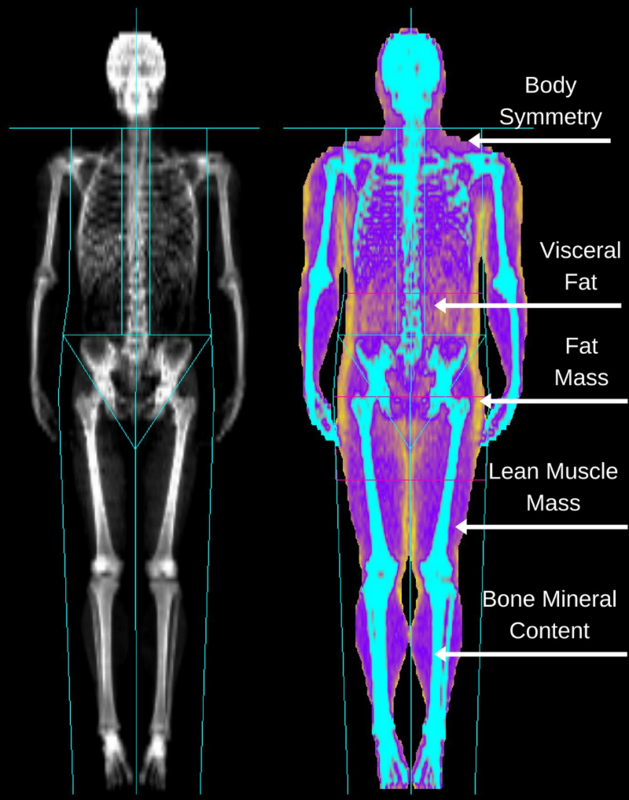 DEXA scans are highly accurate & precise methods to measure body composition. DEXA gives true measured results backed by science; numbers don’t lie, they give the true picture of your body from the inside. Stop guessing and measure right! That is why DEXA scans are the gold standard and will ultimately instill the reality check & drive the motivation to better your health and appearance. Remember, what gets measured gets managed! If you’re not measuring, you’re just guessing – A DEXA scan takes the guess work out of losing weight. It helps you monitor changes in not just your fat mass, but also your lean body mass and even your bone density. I decided to get my body fat tested with the most accurate device known to man. The DEXA scan. ... This is definitely something that I would consider doing a few times per year for fun and to see an exact blueprint of how my body is progressing. 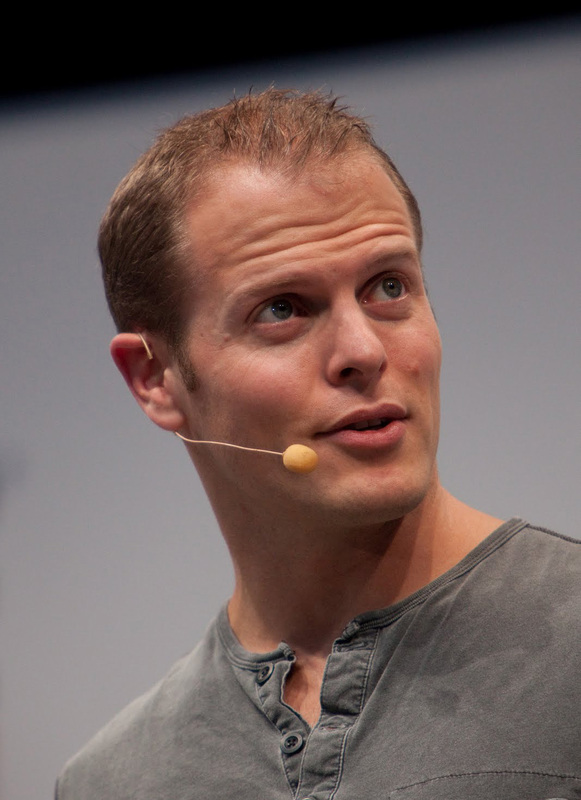 Tim Ferriss author “The 4-Hour Body"
Please use the form below to contact us if you have any questions about the DEXA scan, including pricing inquiries, or to make an appointment. Please send us some dates and times of your availability and we can check the bookings for you. Start taking steps towards increased level of fitness and better overall health today! Note: Our in-house physician does the referral for the DEXA full body scan.